Police responded to reports of an active shooter situation at Topsail High School, with the Pender County Sheriff's Office describing it as an "active scene." Law enforcement and other emergency personnel including firefighters arrived on location at the school on Friday morning about an hour-and-a-half before the school bell rang, local television reported. Pender County Sheriff's Office Captain James Rowell initially told reporters that no injuries were been reported as of 7:04 am local time, and that the call about the possible active shooter in the school came in around 6:30 am. Shortly after 8 am, Rowell said that police were continuing sweeping through the building as a precaution, but that the incident appeared to be a false alarm. — Joe Catenacci (@JoeCats19) 9 ноября 2018 г. Officers surrounded the Topsail campus, which includes elementary and middle school buildings in addition to the high school. 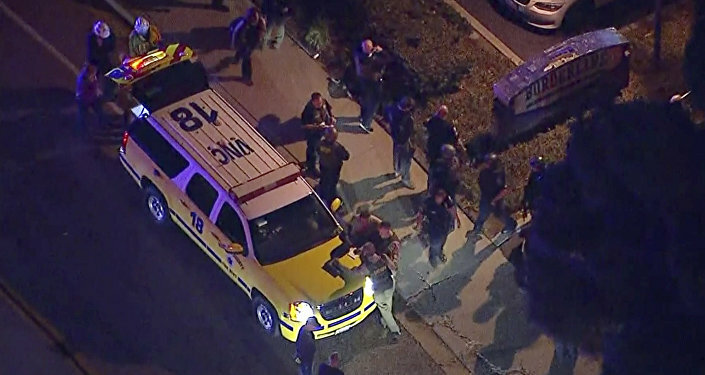 According to local residents, all schools in the area were put on lockdown, with no one allowed in or out, and children which were being bussed in taken to a nearby grocery store parking lot. County Commissioner George Brown was the first to report that a malfunctioning piece of equipment making sounds which sound like gunfire may have caused a false alarm. Captain Rowell later confirmed this version of events, but said that police would wrap up their sweep of the area as a precaution. — DawnDLOLopez (@DawnANjax) 9 ноября 2018 г.
Topsail High School is located in the Town of Hampstead, about 175 km southeast of North Carolina capital Raleigh. The school already faced a code red lockdown in late May. In that incident, two students were charged with bringing weapons, including a semi-automatic gun and knives to the school, with one of the boys claiming he brought a semi-automatic rifle to school to stop a rumoured school shooter. The US has suffered over three hundred school shootings since January 1.